Let’s look in the mirror and be honest with ourselves Los Angeles. We’re huge. REALLY huge. We can fit the entire cities of San Francisco, Cleveland, Minneapolis, Boston, Milwaukee, Pittsburgh, and St. Louis all within our borders and still have room left over for Tuesday’s outdoor vinyasa class. But despite being one of our country’s great ethnic melting pots, LA’s highway sprawl lends itself to a frequent lack of neighborhood cohesiveness. 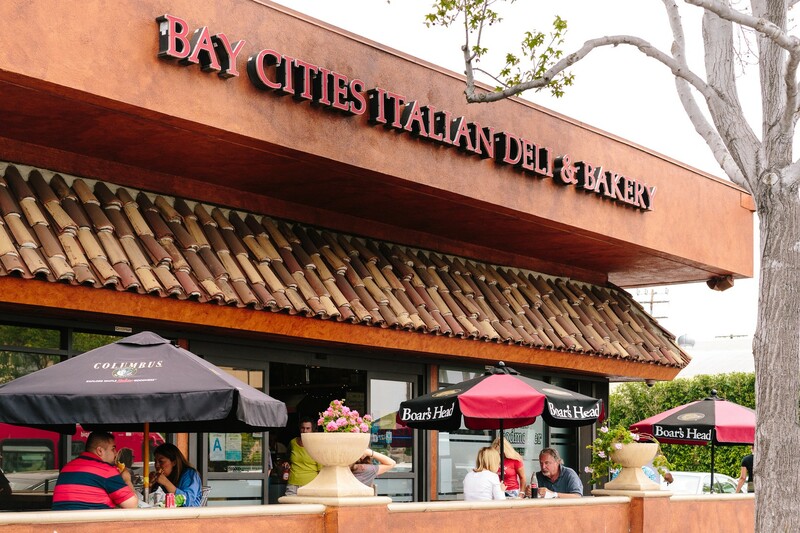 Which brings us to Bay Cities Delicatessen and its important seat amongst our city’s culinary elite. We’ll cut to the chase here. LA is known for avocados, tacos, and juice bars. But family-owned delis operating since 1925? Not exactly. We’re pretty sure there were still mastadons in Santa Monica in 1925, so props to Bay Cities for sticking through the dark times. But thank god they did for now we are rewarded with a world-class Italian deli and grocery the tour bus hellscape of Santa Monica frankly doesn’t deserve. While anything behind the counter is order-worthy, there’s one big, fat shining star. And her name is The Godmother. Genoa salami, mortadella, capicola, ham, prosciutto, and provolone all orgied together with mustard and peppers on two of the freshest slices of Italian bread this side of the Jersey Turnpike. This is the best sandwich in Los Angeles and the line wrapped around the corner knows it. (Tip: order ahead on-line and waltz by those peasants). If you come to Bay Cities and shop at the grocery, we respect you and want you to cook for us. If you come here and don’t order The Godmother, thats f*cked up and we have nothing in common. Because you’ll be missing out one of THE sandwich of our city and frankly, there’s no coming back from that. Duh. This is pure Italian nirvana and an iconic staple in our city’s culinary landscape. Order it with “the works” and feel like a human who has reached their maximum potential. So our meatless friends can join in the fun! This vegetarian-friendly sandwich lives up to the hype because when you combine farm-fresh tomatoes and mozzarella on that beautiful bread of theirs, magical things commence. One of those special off-the-menu items you just sort of point and scream at until the women behind the counter packages you up some. Bay Cities’ version of build-it-yourself. You choose the meats and cheeses, they do the rest. A liberating choice to be sure, but a dangerous one depending on how stoned you are. It’s chicken so it’s a little healthier...right? There are other places around town that fight for the title of best corned beef. Bay Cities isn’t one of them because they just know its d*mn good. Prosciutto di parma, mozzarella, roasted tomatoes, olive oil and fresh basil. It’s like the Caprese that you take home and marry. Bay Cities spreads its diversity wigs on this Jamon Serrano, Copa Seca, Ham, Pamplona Chorizo, olive oil, black pepper, and rosemary . It’s still the size of a nerf football, but you still walk away feeling a little bit better about your health.